It’s that time of year again! The days are getting longer, the weather is getting warmer, and the birds are returning from their winter getaways. Spring has sprung, and with that comes the beloved tradition of spring cleaning! Did you know spring cleaning can actually boost your mood and leave you feeling happier? It’s true! Get started with these five simple spring cleaning tips. 1. Declutter First, Then Clean. Did you know that clutter is one of the most common tripping hazards for seniors? Stacks of old magazines, bags and boxes and other household items can build up in the hallways and entryways, making trips and falls more likely to happen. You can reduce your risk by getting rid of anything that obstructs your path as you move around your home. Consider taping your rugs and carpet edges to the floor to eliminate a tripping hazard. Once the clutter is gone, it will be much easier to clean and get organized. 2. Get Help from Your Family and Friends. Don’t try to tackle your entire home by yourself. Enlist the help of your friends and family to help clean, declutter and organize your home. Cleaning is always much more efficient (and fun!) to do with others. You can reminisce about good times, eat delicious food and enjoy your favorite music as you get everything nice and neat. Plus, your loved ones can help you with tasks that may be difficult for you, such as moving heavy furniture or dusting in hard to reach places. 3. Use the Right Cleaning Tools and Products. 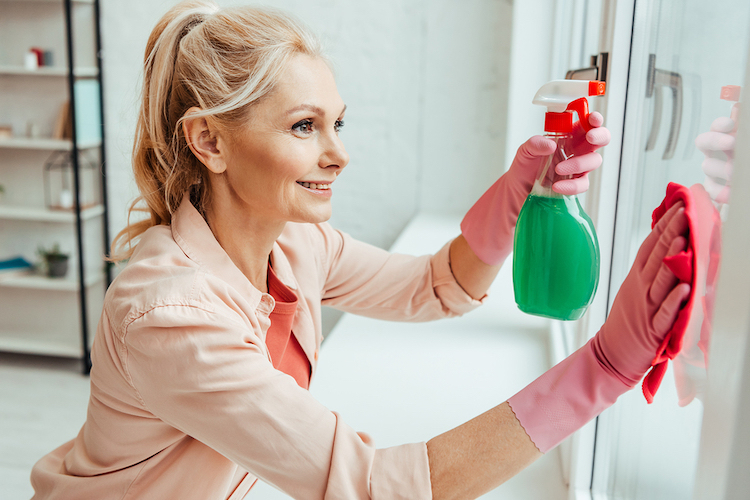 If you have mobility issues, arthritis or suffer from fatigue, using the best cleaning tools and products for the job can be a game changer when it comes to spring cleaning. Try using dusters and brooms with long, extendable handles to safely reach high places. “Set it and forget it” cleaning products can be sprayed on and then wiped dry after a few minutes for convenient and easy cleaning. Consider an automatic vacuum, such as the Roomba, to handle your carpeted floors. 4. Toss Expired Medications and Food. Not only is it dangerous to hold on to expired medicine (taking expired medicine can be harmful to your health), but old meds clutter up your medicine cabinet! Take some time to go through your medications and properly dispose of any unused or expired ones. You may want to check with your city’s waste disposal department to ask about the proper way to dispose of them. Go through your pantry and toss anything past the expiration date. Don’t rely on the smell or taste of it to see if it’s still good. Expired food often loses its nutritional value, not to mention the risk of food poisoning or other food-borne illnesses like salmonella or listeria. 5. Check Your Smoke Alarms, Carbon Dioxide Detectors and Fire Extinguishers. Many people use Daylight Savings Time as a reminder to check their smoke and carbon dioxide detectors, so why not incorporate this into your spring cleaning routine? Put fresh batteries in your detectors, and double check that your smoke alarm is still working. Don’t forget your fire extinguisher! Most last between five and 15 years, and if yours has a gauge, it should be checked to make sure it is charged properly. If you have a medical alert system, use this time to check the batteries in that as well. Spring is the perfect time to take a look at your living arrangements and consider whether downsizing your home to a vibrant senior living community is right for you. At Peabody, our neighborhoods are designed to provide stress-free, convenient living. From restaurant style dining rooms to housekeeping and personal laundry service, seniors here have everything they need to thrive and live happy, healthy lives. Contact us today for more information about our living options and amenities, or to schedule a personal tour.